Partypoker raised eyebrows earlier in the year when they announced that they would be hosting an online tournament with a guaranteed prize pool of $20 million. After all, partypoker is much, much smaller than Pokerstars. Could partypoker really pull off the biggest tournament in the history of online poker, or would they be forced to eat significant losses after the event resulted in a large overlay? Any concerns were put to rest on Sunday after a massive 1,574 field turned out for the opening day flight. With a buy-in of $5,300, this meant that partypoker collected nearly $8 million in total prize money on the opening day of the tournament alone. 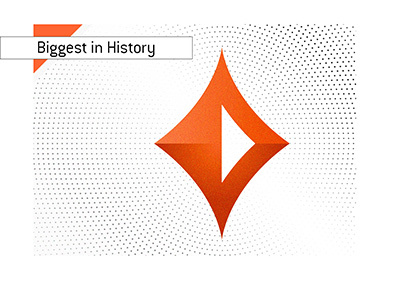 partypoker points out that this was their biggest ever "single flight gathered prize pool - live or online". The tournament has a total of five opening flights, with the next (Day 1B) taking place on Thursday, November 29th (7 pm). After that, there will be a flight on Sunday, December 2nd, Monday, December 3rd and Tuesday, December 4th. Day 2 of the event will take place on Tuesday, December 4th (seven hours after the start of the final "turbo" flight), with the final day taking place on Wednesday, December 5th. The allure of the tournament is easy to see - a guaranteed prize pool of $20 million means that the eventual winner is guaranteed $2.5 million, while the top four finishers will all walk away with at least a million dollars each. partypoker has been pushing their satellites to this event for months, with the company reporting that more than $10 million in satellite seats will be awarded over the course of the promotion. This tournament is also receiving a great deal of interest from players who want to support partypoker, which is doing its best to compete with the 800 pound gorilla of the industry, Pokerstars. Competition is a great thing for all online poker players, and the success of this tournament is going to provide a welcome jolt to an industry that is dominated by Pokerstars.